Functional principal component analysis for sparse longitudinal data usually proceeds by first smoothing the covariance surface, and then obtaining an eigendecomposition of the associated covariance operator. 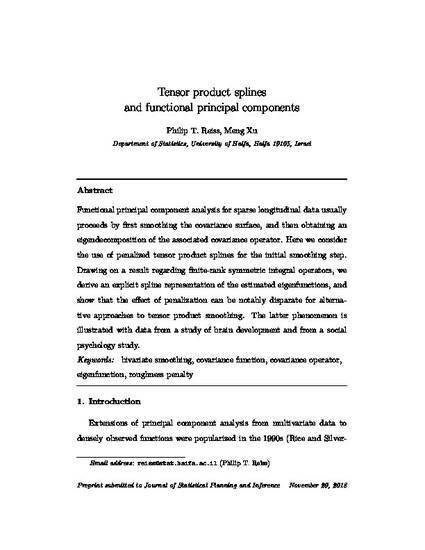 Here we consider the use of penalized tensor product splines for the initial smoothing step. Drawing on a result regarding finite-rank symmetric integral operators, we derive an explicit spline representation of the estimated eigenfunctions, and show that the effect of penalization can be notably disparate for alterna- tive approaches to tensor product smoothing. The latter phenomenon is illustrated with data from a study of brain development and from a social psychology study.